REKJAVIK, Iceland, September 2, 2014 (ENS) – Air travel officials and scientists are keeping a close eye on Holuhraun, a lava field in the Icelandic Highlands, where a volcanic eruption Friday and a larger eruption Sunday has opened a mile-long fissure that is spewing lava, steam and gas. Recalling a huge ash cloud from an Icelandic volcano that disrupted flights in 2010, emergency officials raised the aviation alert warning to red on Sunday, but no commercial flights were affected. Currently, the Aviation Colour Code for the Bárðarbunga volcano remains at orange and the code for the Askja volcano stands at yellow. On Sunday, the fissure spouted lava 200 feet into the air from the lava field between the Bárðarbunga and Askja volcanos, but the eruption has created no ash-fall. A white plume of steam and gas is rising from the eruption on Holuhraun, reaching an elevation of about 4.5 kilometers (2.8 miles) above sea level. Downwind, a volcanic cloud extends from the eruption site. On Monday afternoon the white cloud from the eruption extended 60 kilometers (40 miles) to the north-northeast. In comparison to Monday, more sulfur dioxide has been measured in the eruption cloud. A gas monitoring station has been set-up near the eruption site. Gas measurements indicate a high level of sulfur dioxide. 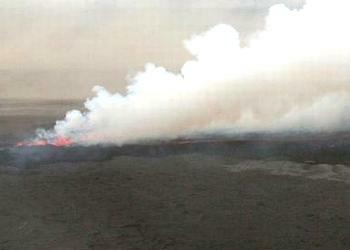 People could be exposed to highly dangerous gas levels close to the eruption. Those visiting the eruption site are advised to come equipped with gas sensors and gas masks. By 14:00 local time on Monday, the lava flow had covered 4.2 square kilometers (1.7 square miles). 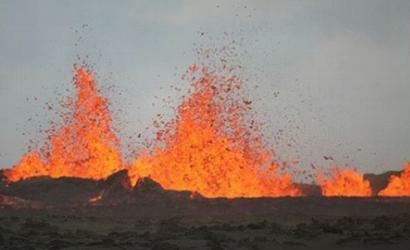 The Iceland Met Office says the release of lava appears to have decreased the seismic activity. Since midnight Tuesday, just 400 earthquakes were detected automatically; there were 700 at the same time Monday. But some earthquakes associated with this event have been much stronger. At 08:58 local time Monday, a magnitude 5.0 earthquake was recorded on the Bárðarbunga caldera, and another of magnitude 5.2 about three hours later in the same region. 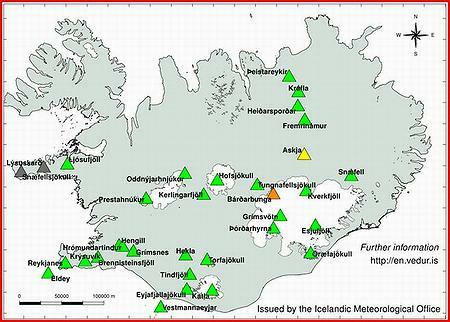 After swarms of earthquakes shook the area for two weeks, the first volcanic eruption started just after midnight Friday, local time, on the Holuhraun lava field, north of the Dyngjujökull Glacier, the Icelandic Met Office said. It remains unclear how the situation will develop. Four scenarios are still considered most likely, according to the the Scientific Advisory Board of the Icelandic Civil Protection. 1 – The migration of magma could stop, resulting in a gradual reduction in seismic activity and no further eruptions. 2 – The dike could reach the Earth’s surface causing another eruption, possibly on a new fissure. Lava flow and explosive activity cannot be ruled out. 3 – The intrusion reaches the surface and another eruption occurs where either the fissure is partly or entirely beneath Dyngjujökull. This would most likely produce a flood in the Jökulsá á Fjöllum river and perhaps explosive, ash-producing activity. 4 – An eruption in Bárðarbunga. The eruption could cause an outburst flood and possibly an explosive, ash-producing activity. In the event of a subglacial eruption, it is most likely that flooding would affect the Jökulsá á Fjöllum and/or four other rivers in the area. In 2010, the Eyjafjallajokull eruption in Iceland spewed ash into European airspace. Thousands of flight cancellations which impacted at least 10 million people. Airlines lost some US$2 billion due to the canceled flights.